I’m not upgrading this year, but was curious. Just before I went over to Yodobashi Camera and compared the iPhone X (on the left) to the iPhone 8 Plus (on the right), side-to-side. The main purpose was to see if the letters on the iPhone X were smaller than on the iPhone 8 Plus. 1. First, the display of the iPhone X is clearly better. It’s obviously more beautiful. 2. I didn’t measure, but it’s my impression that the character size on the iPhone X is actually a bit larger, not smaller. 3. Since the iPhone X is narrower, naturally sentences word wrap sooner than with the iPhone 8 Plus. 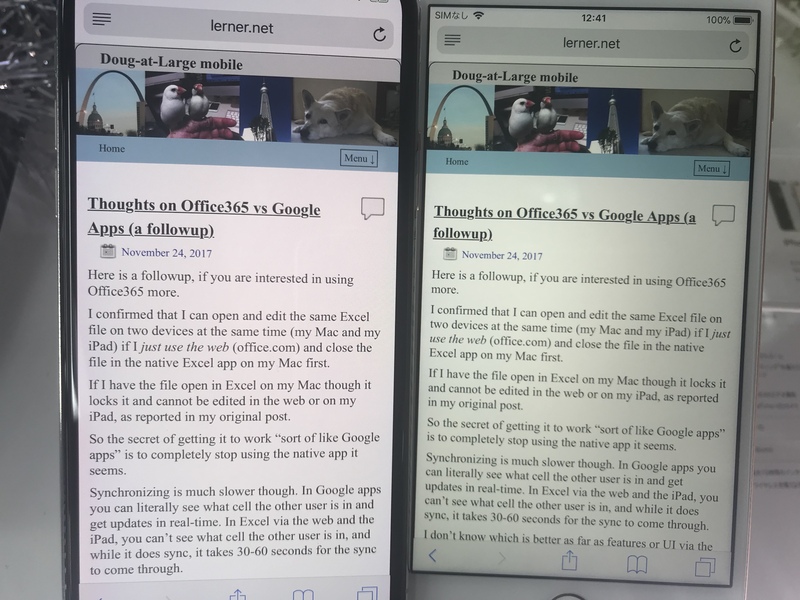 The amount of text is almost the same, but you can see just a bit more content on one screen on the iPhone 8 Plus than with the iPhone X.
I think the iPhone X is the winner in this test. You can click on the photo to see it larger.